In 27 branch locations across the 12 library systems in Niagara, residents can access a wide variety of information services, reading material, technology, and programming. The Ministry of Tourism, Culture and Sport releases statistics from every municipal public library system on an annual basis. 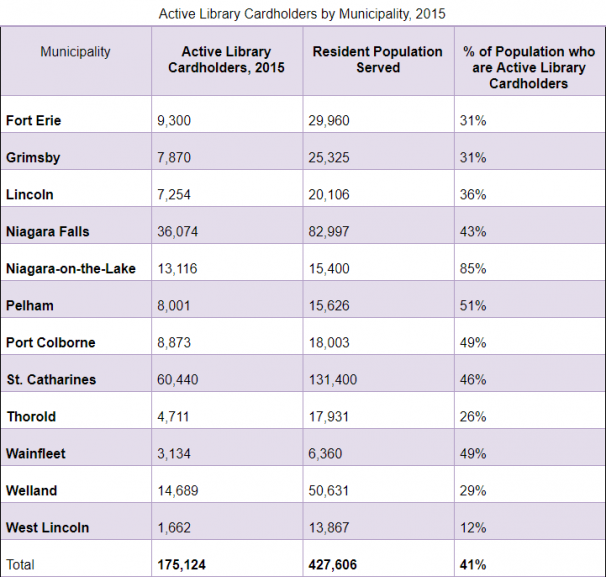 The following table illustrates the total number of active library cardholders in Niagara. In 2015, 175,124 people in Niagara were active library cardholders. Source: Ministry of Tourism, Culture and Sport. Ontario Public Library Statistics. The table below compares total library usage from 2013 to 2015, across each of the 12 municipal public library systems in Niagara. “Total library usage” includes electronic uses (workstation, electronic database use, electronic reference transactions, and visits to the library website) as well as non-electronic uses (circulation, program attendance, in-library use of materials, standard reference transactions, and in-person visits). Doors Open Ontario: Grimsby, Niagara-on-the-Lake and St. Catharines participated in the Doors Open Ontario program in 2017. Every year, this program attracts large crowds across the province. From April to October, residents and visitors are invited to discover first-hand Ontario’s hidden heritage treasures, some of which have never been open to the public. Since the program was launched in 2002, nearly seven million visits have been made to heritage sites participating in this exciting initiative. Culture Days: During the 2017 pan-Canadian Culture Days event, a total of 61 Activities were offered across Niagara, held September 29 to October 01, 2017. Since its inaugural year in 2010, Ontario Culture Days has featured over 10,800 free arts and cultural heritage activities in all disciplines in Ontario as a part of the national Culture Days celebration, the largest public participation campaign undertaken by the Canadian arts and cultural community. Beginning the last Friday of September, the annual Culture Days weekend features hand’s-on, behind-the-scenes, community-engaged activities inviting the public to contribute to arts and culture across Canada. Contributing $44.5 million to Ontario’s tourism economy since 2010 ($8.0 million in 2016), each year Ontario Culture Days draws over 500,000 attendees, and 135,000 artists, workers and volunteers in 165+ cities and towns across the province. Generating 61.4 million marketing impressions and 62 million media impressions in 2016, Ontario Culture Days’ contributions to the public profile and awareness of arts and culture across Ontario are unprecedented. Reclaiming Cultural Identity is a program offered by Niagara Falls History Museum in partnership with the Niagara Regional Native Centre. Workshops and talks on Wampum Belts, Indigenous Beadwork in Niagara and Creation Stories are offered, for Indigenous and non-Indigenous participants. Education is seen as the key to facing the truths of history and forging a path together. Niagara Artists Centre (NAC) is a not-for-profit, charitably registered, member-driven collective formed by and dedicated to serving the working artists and community of Niagara. Founded in 1969, NAC is one of the oldest artist-run organizations in Canada. South Niagara Artists is an independent group of artists promoting art and culture in the South Niagara area. They offer information about local artists and offer studio tours. The Arts and Culture Alliance of Fort Erie (ACAFE) is a communication network for arts and cultural groups in Fort Erie. ACAFE aims to open up paths of communication to help the arts and cultural community realize its potential and positively impact the social fabric and economy of the community. cNiagara is an online event listing and information site for arts, heritage and festivals in Niagara. 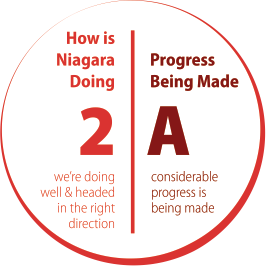 Launched in 2012, through the “Marketing the Arts of St. Catharines-Niagara” project, cNiagara.ca was developed by a partnership of: Carousel Players; the Centre for the Arts at Brock University; and the City of St. Catharines. Financial support came from the Department of Canadian Heritage, the Cultural Capitals of Canada program, the Province of Ontario’s Cultural Strategic Investment Fund, the Region of Niagara and the City of St. Catharines. The FirstOntario Performing Arts Centre (PAC) is a cultural complex located in downtown St. Catharines. Since the FirstOntario Performing Arts Centre opened in 2015, there have been over 1,100 ticketed events, over 150,000 tickets sold, and over 200,000 patrons through the door. The Foster Festival, which launched in 2016, is the resident summer theatre festival at the new Performing Arts Centre (PAC) in St. Catharines. The festival showcases the work of internationally renowned Canadian playwright Norm Foster. In its first season, the festival sold 5,000 tickets, worked with 125 drama club participants, and was supported by 1,500 volunteer hours. In 2016, 79% of festival audiences came from Niagara; 19% from Ontario; and 2% came from outside Ontario. The festival’s Drama Club for Kids partnered in 2016 with Boys and Girls Club of Niagara, the Niagara Children’s Centre, and the Kristen French Child Advocacy Centre, to deliver free of charge arts enrichment programs to these agencies’ young clients. Qualified arts instructors from Niagara delivered these programs, with funding support from the Ontario Trillium Foundation. The Marilyn I. Walker School of Fine and Performing Arts is the home of Brock University’s Department of Dramatic Arts, Department of Music, Department of Visual Arts, and Studies in Arts and Culture. The school was formed in 2002 as an interdisciplinary centre for creative and scholarly activities. In 2008, a $15-million gift from Marilyn I. Walker was key to securing the historic Canada Hair Cloth Building in downtown St. Catharines for adaptation as a state-of-the-art learning facility, which opened in 2015. The Shaw Festival in Niagara-on-the-Lake is a theatre company inspired by the work of George Bernard Shaw. The Festival produces plays from and about Shaw’s era and contemporary plays that share Shaw’s provocative exploration of society and celebration of humanity. Local audience members are joined each season by patrons from every state in the United States and every province in Canada. Patrons come together to enjoy world-class live theatre on four stages in the historic setting of Niagara-on-the-Lake. The Shaw Festival’s economic impact is estimated to be $74.5 million. Niagara Parks maintains several heritage sites across Niagara, including sites related to First Nations history, the War of 1812, and the Underground Railway. The HEART (Health and Equity through Advocacy, Research, and Theatre) participatory action research project was completed in 2016. The project was led by medical students at McMaster University’s Michael G. DeGroote School of Medicine Niagara Campus. It articulates the views of homeless individuals in Niagara, regarding the significant healthcare challenges they face around: access and discharge from hospitals; adequate and comprehensive psychiatric and mental health services across service providers; and availability and continuity of care from family doctors. With funding support from the Niagara Community Foundation, the students worked with Toronto-based Branch Out Theatre to create a ‘legislative theatre’ play to engage community stakeholders in a conversation based on the voices of homeless people regarding their interactions with the local healthcare system. Three performances of the play were staged in the Robertson Theatre of the FirstOntario Performing Arts Centre (PAC), for audiences that included medical and nursing students; health care professionals; and people living in extreme poverty. Performances were followed by panel discussions that included leaders in regional government, the local health system, social services and other community groups.